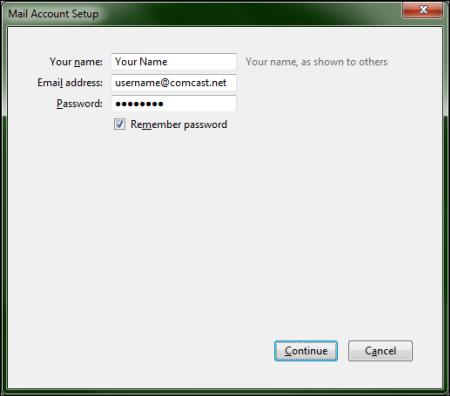 To configure Mozilla Thunderbird client to work with Comcast email, follow the steps below. Click the Tools menu and select Account Settings. Click the Account Actions button in the bottom left, then select Add Mail Account. Enter your name into the Your name field, your full email address into the Email Address field, and your password into the Password field. Click Continue. Select IMAP from the drop-down box. In the Server hostname field, enter imap.comcast.net. Select SSL/TLS from the drop-down box under SSL. Confirm the Port field contains 993. Authentication Method should be set to Autodetect. 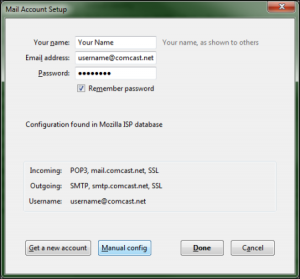 In the Server hostname field, enter smtp.comcast.net. 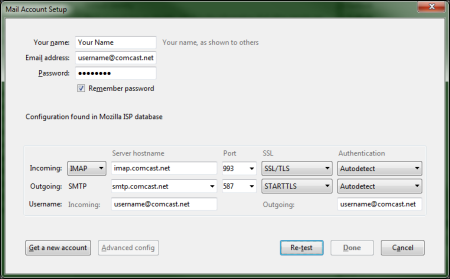 Select STARTTLS from the drop-down box under SSL. Enter 587 into the Port field. Congratulations! 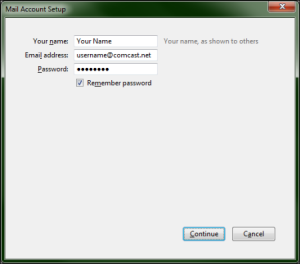 You’re done configuring your Mozilla Thunderbird client to send and receive Comcast email.